Iran is engaged in an elaborate oil smuggling scheme that enables it to skirt international sanctions as it transmits valuable crude oil to China, according to an investigation released last week by a watchdog group. Iranian ships have been travelling out of the country’s Kharg Island oil export terminal, making their way east of the Strait of Hormuz, then shutting down communication devices in order to mask their activities, according to United Against Nuclear Iran (UANI), which recently concluded a detailed investigation into Iran’s sanctions-busting behaviors. 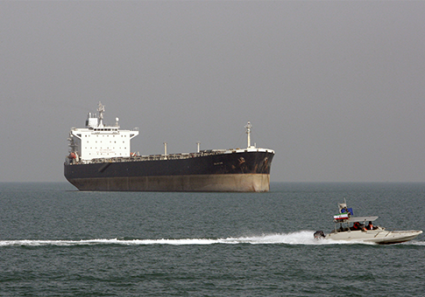 UANI discovered Iranian ships are illicitly offloading their crude oil at sea, falsely billing it as a legal product, and shipping it to China, which is the top purchaser of Iranian crude oil. Western governments including the United States have failed to act on this new information despite UANI’s efforts to petition authorities, a spokesman told the Washington Free Beacon. Iran activities can clearly be classified as illegal smuggling because "the vessels transfer their oil to other vessels in secret, in order to disguise its origins and circumvent international sanctions," UANI spokesman Nathan Carleton said. "This sanctions fraud enables Iran to engage in an oil smuggling operation primarily based out of the port of Fujairah, wherein sanctions waiver recipient countries are duped into buying additional Iranian oil mislabeled as Iraqi Special Blend to disguise its Iranian origins," UANI ultimately concluded, according to a statement posted on its website. "Oil delivery from Iran to China takes 21 days," UANI states in a new video presentation on the matter. The organization used satellite information, shipping data, and primary sources such as whistleblowers to conduct its investigation. "The [Iranian] vessel clandestinely performs [a] ship-to-ship transfer at [an] offshore anchorage over several days," UANI discovered. The original vessel then reenters Iranian territory "after failing to transmit location data for six days." "The vessel did not fulfill its claimed delivery to the declared discharge point," meaning it is unclear where the ship’s contents have gone, according to UANI. A second ship possessing falsified documents is believed to carry the smuggled oil to China in violation of international sanctions. UANI has been pressuring Western governments to act on this new information since February but has yet to receive a reply. "We are still awaiting replies from the parties we wrote to," Carleton said. The watchdog group shared its findings with the White House, as well as with the governments of the United Arab Emirates, the Philippines, and Tanzania. "The purpose of this letter is to inform you of this Iranian-sponsored fraud, which is designed to avoid the full impact of oil sanctions against Iran and to seek your assistance in stopping the elements of the schemes that operate within your jurisdiction," UANI wrote in February. "Unfortunately, this sanctions fraud is perpetrated, at least in part, within the jurisdiction of the Emirate of Fujairah and its important port/bunkering hub, and with the assistance of a Dubai/United States-based criminal enterprise, Philtex Corporation (‘Philtex’), and its affiliate the American Register of Shipping (‘ARS’) that appears to predominantly operate in the Philippines," UANI said. "The sanctions fraud enables Iran to avoid the impact of international sanctions and to sell and trade far more oil than would be permitted under international law," according to UANI. "By this letter, we respectfully request that you take immediate action to end this fraud and/or the parts of the fraud that occur within your jurisdiction and specifically in Dubai, Fujairah, the Philippines and the United States," UANI wrote. Iran engages in these elaborate schemes in order to sustain its revenue streams, which are needed to pursue nuclear-related activities. "The Iranian regime and its illegal nuclear weapons program are dependent on international shipping for the import of sensitive technology and industrial goods as well as for its crucial export of oil, the proceeds from which are used to fund Iran’s illicit activities," according to UANI’s letter. "Iran uses several front companies to falsify documents and use ships that appear to have originated in other countries, including Zanzibar, Tanzania and others," the group said. "In order to do so it has created an elaborate scheme to falsely classify, document and flag Iranian oil tankers." Iran’s behavior is illegal because the regime is violating the "International Convention for the Safety of Life at Sea (‘SOLAS’), which stipulates that vessels must use their [satellite] transponders except in extraordinary circumstances (piracy) and carry legitimate insurance and classification—something that only large societies and insurance firms … can provide," Carleton said.